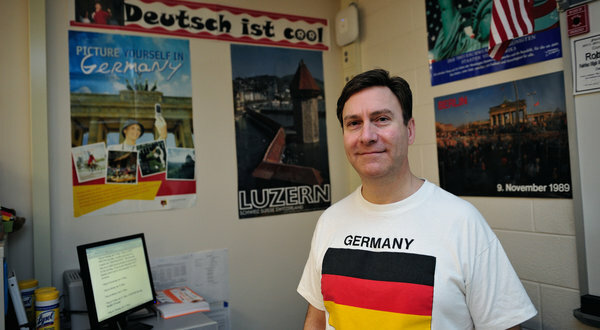 Robert Williams, who teaches German at Fairfax High School in Virginia, says students come in with negative images of Germany, and Mandarin is encroaching. ON the day in November 1989 that the Berlin Wall came down, Michael Legutke, a linguist working for the West German government, was in Casper, Wyo., leading a training workshop for the state’s German teachers. When the TV news affiliate learned there was a real live German, right there in Casper — and one who had grown up in East Germany and spoke flawless English — he was recruited to do a live feed. Dr. Legutke found himself facing a camera, taking turns offering news commentary with Tom Brokaw in Berlin. Moved by the images of East Germans streaming through the breached wall into the west, Dr. Legutke wept during the broadcast.